IRS Approved Laser Printer W-2 4-up Blank - without Back Instructions - with Envelopes - Set of 50 by EGPChecks at MDA-MA. MPN: TF5221E. Hurry! Limited time offer. Offer valid only while supplies last. 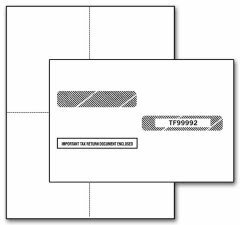 Item Number 82978 (replacement item TF5221E) Use your laser printer and software to print W-2 forms with employee wage and withholding information!